It’s virtually impossible to go through any health or beauty store without seeing advertisements for the amazing benefits of coconut oil. Coconut oil is cherished by many health enthusiasts for endless reasons. There are thousands of videos on Youtube and social media showcasing all the creative ways people use coconut oil. Since it’s mildly scented and lighter than most oils, it can be used as cooking oil for your stirfry, a hair conditioner, and even in lieu of lotion as the ultimate skin moisturizer! Because coconut oil is so versatile, it has also been deemed to be a super power oil that can be used to treat a long list of health issues. Many people view virgin coconut oil as a superfood that can heal and fight cancer and other diseases. Read on to discover the are amazing benefits of coconut oil for cancer patients. Colon cancer is a common cancer that can be very painful. Besides skin cancer, colon cancer is the third most common cancer diagnosed for men and women in the United States, according to The American Cancer Society. During a recent study, The American Cancer Society estimated there are 97,220 new cases of colon cancer in the United States in 2018. Breast cancer is the most common cancer in women. Around 1 in 8 U.S. women (about 12.4%) will develop invasive breast cancer over the course of her lifetime. All races and genders are at risk for getting cancer. Fellas, listen up! Men are still susceptible to developing breast cancer. Although the breast cancer statistics for men are not as well known as the female breast cancer statistics, men are still at risk for breast cancer. Breast cancer is about 100 times less likely to occur in men, but that doesn’t mean the danger doesn’t exist. The American Cancer Society says an estimated 2,550 new cases of invasive breast cancer will be diagnosed amongst men in 2018. Chemotherapy is one of the most common treatments for breast cancer. Although chemotherapy can slow or potentially stop the growth of cancerous cells in breasts, the treatment itself can be very stressful and take a huge toll on your body. Chemotherapy treatment often comes with uncomfortable side effects like nausea and vomiting, hair loss, fatigue, pain, anxiety, and even depression. Studies show that virgin coconut oil can decrease the side effects of chemotherapy, potentially easing the chemotherapy pain for breast cancer patients. The overall improvement in the quality of life was seen specifically in the lives of breast cancer patients who used coconut oil, according to a study by Lipids in Health and Disease. 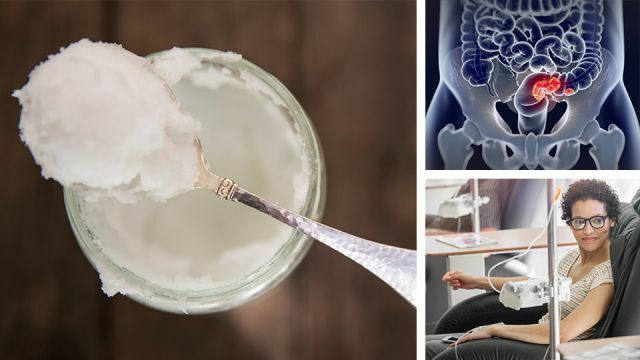 The cancer patients who used virgin coconut oil during the study saw an improvement in their fatigue, dyspnea, sleep difficulties, and loss of appetite symptoms in comparison to patients who didn’t use virgin coconut oil. The patients who used virgin coconut oil also had improvements in breast functioning, body image, sexual function, future perspective, breast symptoms, and systemic therapy side effects during chemotherapy and radiotherapy treatments. Maintaining a healthy immune system can be extremely challenging while battling cancer. Undergoing chemotherapy can wreak havoc on your body causing your immune system to plummet. Since coconut oil is loaded with medium chain fatty acids, it’s the perfect product to increase the function of your immune system when used as a dietary supplement. Coconut oil is the best oil for your immune system. It’s even known to be more effective than unsaturated oil! Coconut oil has antimicrobial, antiviral, and antifungal benefits. Using coconut oil while cooking or in supplements, disrupts the lipid membrane, killing the pathogens without damaging the cancer patient or harming healthy bacteria in the body. Coconut oil also contains monoglycerides and fatty acids, like lauric acid and capric acid, that help act as antimicrobial functions to fight troublesome germs and viruses. There are many ways to use coconut oil. When one of my close family friends was diagnosed with coconut oil, she was instructed to avoid certain over the counter lotions that contain harmful dyes and perfumes that can be skin irritants. Try rubbing coconut on your skin as a replacement for processed lotions. Coconut oil is light so you won’t feel like a grease ball after applying it to your skin. It will provide moisture and you’ll even smell a little sweet too! Coconut oil is easily absorbed by your body and can be used to make your skin and hair glow, in liquid oil form for cooking purposes, or mixed into your favorite smoothies. If you bounce with joy at the thought of baking a delicious treat, check out this tasty recipe for Vegan Coconut Zucchini Chocolate Chip Bread. Coconut oil is worthy of the praise it receives. With the vast number of benefits of coconut oil, it can greatly improve the lives of cancer patients. With it’s growing list of benefits, you should definitely give it a try. What ways have you used coconut oil before? Share your story in the comments below! Hey Buddy!, I found this information for you: "3 Amazing Benefits Of Coconut Oil For Cancer Patients". Here is the website link: https://www.thealternativedaily.com/3-amazing-benefits-coconut-oil-cancer-patients/. Thank you.